What to call a place that uniquely honours gardeners that lost their lives in World War One? Spain and The Med don’t cut it for the endangered European Eel. Instead of settling for Ibiza to explore courtship and mating, this amazing eel hitch hikes on the intercontinental oceanic currents and, soon after turning 20, scoots over to the Bahamas to lay eggs. After eggs hatch, larvae then float back to Europe and become Glass Eels before entering the freshwater system to become prey of herons, other fish and humans. Those that don’t become lunch for something else, grow to 1 m long before the itch for the Bahama-Summer becomes both too much and energetically feasible. So when a friend in Canberra said their niece worked for the prestigious Zoological Society of London and might be able to hook me up with some genuine London Eel action, of course I said “yes please”. Trading Big Ben for Eric the Eel was an easy choice. The Society coordinates a city-wide citizen scientist program to monitor the ‘Elvers’ (young eels), the little ones returned from their Bahamas birthing. During the traverse to River Loddon from the zoo I learnt that the Thames River water quality is actually improving, it is home to a hundred+ species of fish, and seals and otters that chase them! Apparently people even swim in the Thames. It turns out the brown sedimentation is here to stay due to the estuarine nature of the system, but industrial and domestic pollutants continue to decline, improving suitability for a variety of species. During the trip I also came to appreciate the variety and depth of conservation projects that Zoological Society of London is delivering around the world – it turns out the London Zoo is more than a Zoo! Profits from Zoo entrance fees, and uniquely priced cafe food and merchandise have to be reinvested into the Zoo itself or the local and international conservation projects. 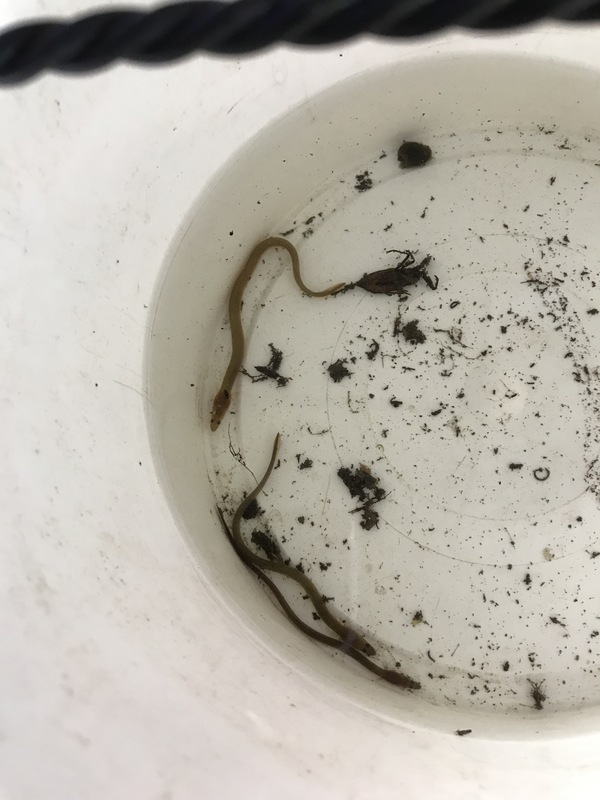 Our River Loddon survey sample was moderately successful, we picked up four elvers for processing, these gals and guys were 70-90 cm long and, remember, born in the Bahamas last year! It was great to see these critters making it this far up the Loddon without falling foul of the Herons either side of the bridge. Fingers-crossed these guys can make it to maturity and then trek-on back to the Bahamas to the pass their genes on. Maybe some of the smarter eels might find a closer breeding site in the meantime? In big cities open spaces for the community are premium property. With everyone stacked-up on each other in apartments and terraced houses, the slightest sunshine brings everyone into the parks for their dose of open space and fresh air. I have often reflected that the European landscape has such a long history of being used primarily for agriculture, and that that must have meant that today’s custodians with their ever-growing appreciation for lost biodiversity, might treat every remaining biodiversity and landscape asset as being worth a lot more than we do in Australia (where we still have much to lose – despite the worst extinction rate for our unique mammals ON THIS PLANET). Great to be able to share some exciting news – I have been awarded a Churchill Fellowship to travel to the UK and explore the ins-and-outs of some of the most amazing conservation and community engagement projects in the world. In later years of Winston Churchill’s life he was engaged significantly with the natural landscape, especially through his painted artworks. I am most grateful and very excited to be able to experience first-hand some internationally renowned conservation initiatives. My sense is that there is ALWAYS more to learn: I am particularly looking forward to meeting like-minded people and exploring sites, programs and facilities that can help shape the future of our equally exciting projects in Canberra and elsewhere in Australia. While Europe has a longer history of environmental degradation than Australia, it also has a longer history of successful conservation programs and organisations. In July-August next year (2017) I hope to visit organisations and sites as diverse as the Eden Project (their photos above), the Wildfowl and Wetlands Trust (including London and Slimbridge Wetlands Centres), Trees for Life, the Canal and River Trust, and the Borders Forest Trust. I have begun the process of reaching out to these and some other amazing organizations to seek an invitation… fingers crossed. Be stoked to see one of these…. 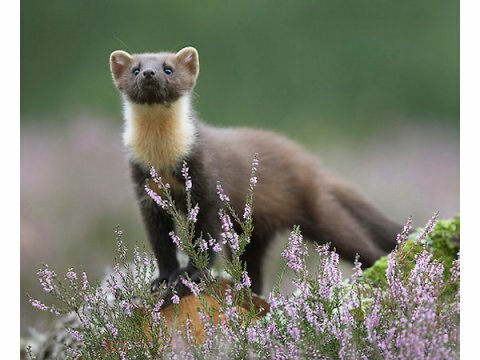 These and other Trusts in the United Kingdom can provide insights into the right mixes of legislative, policy, business operations, partnership, land tenure, science and community support arrangements that enable the establishment of long-term and secure funding arrangements for biodiversity conservation in Australia. This project will help better-inform the Australian conservation community about more efficient models that can add-value to existing government- and community-lead public good programs. Thanks to the Churchill Trust for the opportunity, and to the referees who supported my application – Tony Peacock, Alison Russell-French, Peter Davey and [then Environment…] Minister Greg Hunt. Fitzroy Falls is really a showcase of waterfalls – from above, from on top, from the side and from afar. In fact it’s every way of experiencing waterfalls while staying dry. A great Winter waterfall way. Glow Worms are like Fireflys that failed to launch. I’m sure there is a more apt technical description like ‘Glow Worms are the larvae of fungus gnats’. In local colonies they present an astronomical Milky Way-like phenomenon in the right setting (like at Newnes). So it was we were searching for that starlight on the ceiling experience at the ‘Glow Worm Glen’ at Bundanoon in Morton National Park. The experts recommended searching for Glenn over the Summer months – but we had an hour to kill and the need to burn energy in Ms 4 & 6. While the sign said two hours return – we were “nah, that’s always overestimated”. So it was “off we go kids – lets go find Glenn” – and we streaked down, down, down, the 1 km path to the Glen. 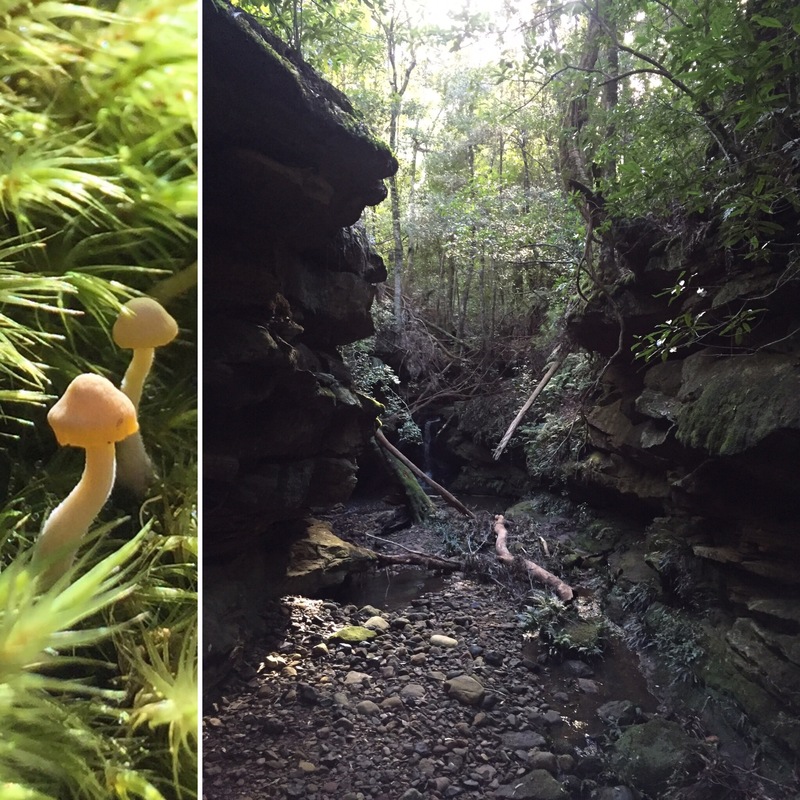 A beautiful rapid stroll through urban interface, sclerophyll and into a rainforest gully. The trail is easy and well-established and the boardwalk at the base is great. Ending in a sandstone room with a bubbling stream – the ideal place to find Glenn, Glenys and Grandaughter Guilfoyle hiding in the cracks. 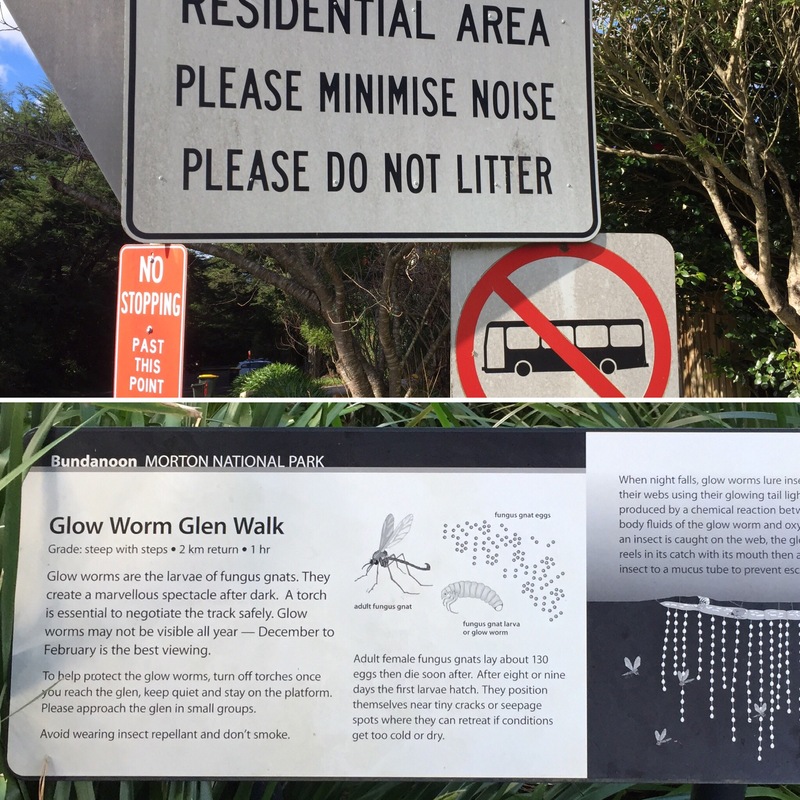 Alas – the NPWS folks were right the best time to find Glenn is in summer-time. We were back out in 50 minutes round-trip – meaning we have an hour and ten minutes up our sleeve to do it next time! On a Winter long weekend hundreds of visitors have their breathe taken away on the cliff-hanging platform at Fitzroy Falls. But a fraction take the Wildflower Walk. However – a minute off the main boardwalk and a prominent ray-gun call from deep childhood memories piqued the ears. Sure enough there it was again just ahead of us and responding to far-off calls ahead and behind us. Largely uninterested in our presence we were treated to a blasting male Lyrebird calling and scratching, scratching and calling. A unique and amazing Australian wildlife experience. For 23 years ‘Operation Bounceback’ has been fighting feral animals in the Flinders Ranges. Imagine seeking an annual budget for the same project 23 times! That takes vision, commitment, determination, quality and the support of about 10 different Ministers. At the 20 year celebration, it was highlighted ‘SA Government, staff, volunteers, landholders and local communities work together to reverse some of the impacts of the last 150 years’, and by the logos on the report cover, the Australian Government is probably also a partner-organisation. It is a classic example of a trusted partnership for conservation. Controlling foxes has been a priority since 1993 and Grasswrens, Pythons and the Yellow-footed Rock-Wallaby are already benefiting. The current fox-baiting effort covers 5,500 km2. According to my Twitter profile, I have been on social media since 2010. It seems to me the camera trap really came of age last year as a tool for publishing ecological interactions instantaneously. Perhaps I followed different people in the year, or a few big labs brought their cameras in for the first time, but there was a plethora of cool stuff captured and shared in Australia in 2014. 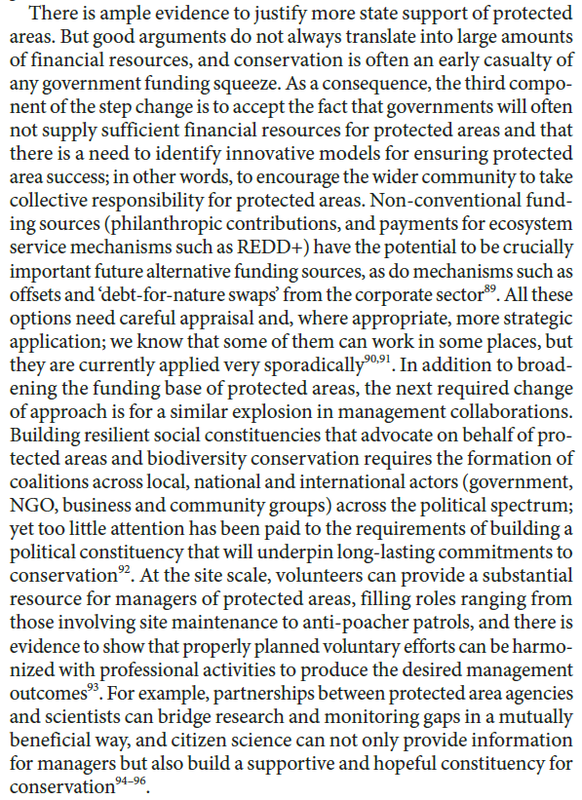 ‘there is a need to identify innovative models for ensuring protected area success; in other words, to encourage the wider community to take collective responsibility for protected areas’ (in the pre-eminent “Nature” this week – Watson et al 2014). Presumably the publication of this article is designed to coincide with the World Parks Congress in Sydney. See the full passage copied in the image on the right. This gold-plated publication has reinforced and confirmed my observations of, and concerns regarding, the institutional arrangements responsible for biodiversity conservation over the last 20 years of my professional interest, and longer, for my personal interest (in NSW, QLD and the ACT). 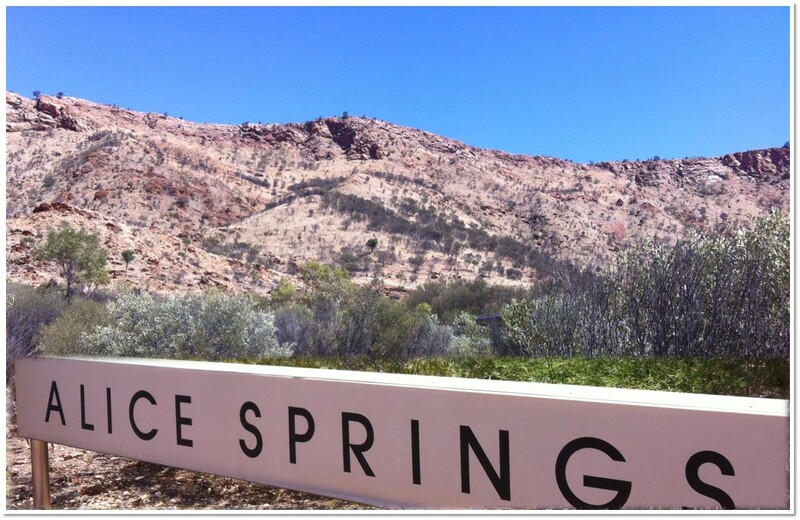 Alice Springs – the first impressions are great! I do quite like going to Floriade once each year, and marveling at the abundance and colour of the exotic flowers. You are certain to see an array of mostly-European flowers arranged in different patterns each year. However, a much more exciting floriade unfolds at the same time, to nature’s choreography. 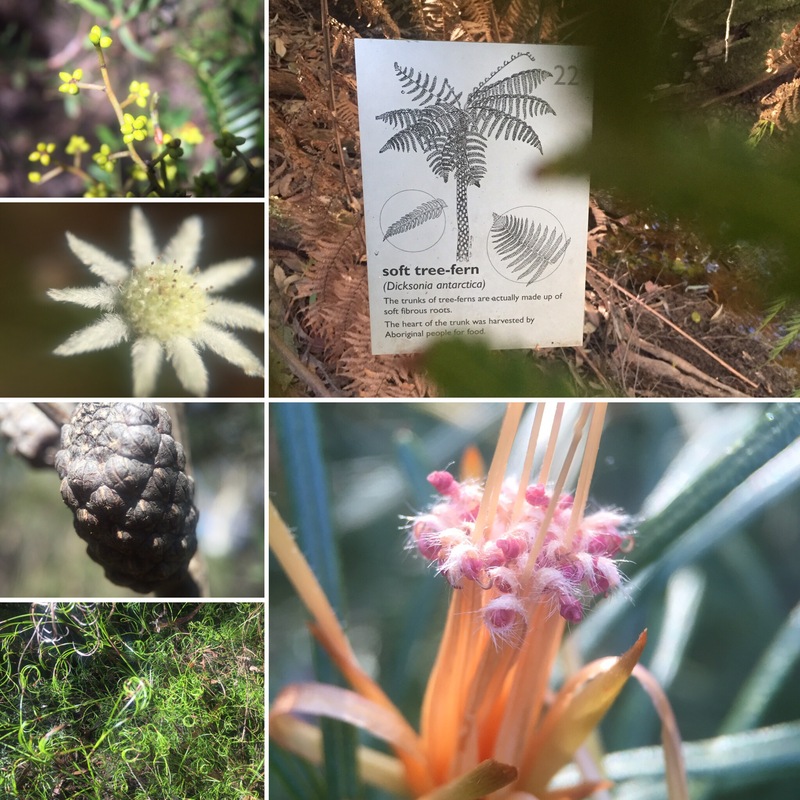 Last night I had the pleasure of being part of the Mulligans Flat – Goorooyarroo Woodlands Experiment; an internationally significant research program seeking to experimentally rebuild an ecosystem, with a focus on reintroducing each of the faunal components of the trophic system (and examining the flow-on, restorative ecosystem engineer affects). Owing to the benefits to both human and nature’s well-being, and wide spread disconnection, a connection with nature is something many people and organisations are keen to increase. So there is a need to know how best to do this. We’ve already developed specific interventions, such as 3 good things in nature, but our wider framework of effective routes to nature connection has just been published in Plos One. I’m excited about this work is it provides guidance for those seeking to re-connect people with nature, indeed it has been central to much of our recent nature connections work, for example, guiding the type of activities promoted as part of The Wildlife Trusts highly successful 30 Days Wild campaign. Mount Majura presents the landscape entrance to the bush capital, framing the transition from the highway-in to Griffin’s Northbourne legacy. How often have you driven past and not gone in? The Canberra Times rated the walk up Mt Majura as one of the top 5 ‘uphill’ walks in Canberra. So being here a decade now we figured we should make the effort to find a starting point and give it a crack. More than a heart-starter, the Mt Majura walk (also part of the Centenary Trail) showcases the bush capital landscape, from far-reaching vistas to a variety of bushland types that together build the fabric of the landscape. The walk begins in critically endangered Box Gum Grassy Woodlands – of decent condition but absent of much fauna (200 years ago one might have encountered echidnas, bettongs, red-necked wallabies) – and ascends through one of the most significant patches of habitat for Glossy Black Cockatoos in the region. A corridor of Allocasuarina has been supplemented by recent habitat restoration efforts. Although none of the elusive birds were on show today it must be one of the closest and most accessible places to happen across them. The crackle of the Cockie’s cones echo their recent presence… channeling Robert Macfarlane’s Landmarks – perhaps the bed of half chewed casuarina cones could be called a ‘chewbed‘. A walk well-worth repeating in the hope of encountering the elusive Cockatoo.